Now that I've finally finished my London-Athens/Parthenon travel diaries, for now at least, I wanted to add a couple of posts about random references and influences that got me here or popped up along the way. The trip inspired a desire to watch a number of movies, including Clash of the Titans and, as I mentioned briefly on day 5, The Last Unicorn. Interestingly, the two films were made just a year apart (1981 and 1982, respectively). I found Clash of the Titans a little difficult to get through, in part because of the visual effects, which are downright clunky compared to today's technologies, and in part because I found it a little boring, actually, although I did enjoy spotting Athena and her owl. The owl-bot she later creates for Perseus is totally Greek mythology's R2D2. 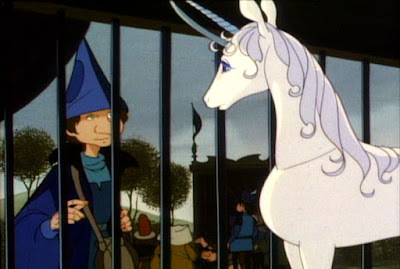 The Last Unicorn is similarly clunky, visually, but I had no problems getting through it, this umpteenth time many, many years after my initial memories of it. I felt like I needed to watch it again to try and figure out why I kept thinking about it on this trip. 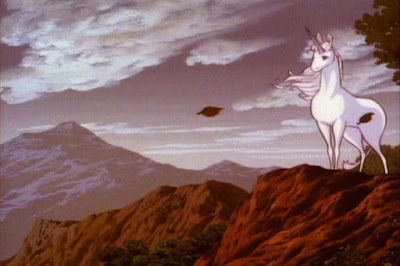 What on earth could The Last Unicorn have to do with the Parthenon? On some level, I think it's as simple as a weird connection between memories associated with the time this film came out and my experiences watching it as a 5, 6, 7-year old girl, and qualities inherent in the history of the Parthenon that attracted me to it for, initially at least, inexplicable reasons. But watching the film again, making notes and capturing stills, did illuminate some details that I think just might be relevant. In case you're unfamiliar with the story, let me break it down for you. The film begins with two hunters making their way through a forest, where the younger hunter wonders, "Why do the leaves never fall here? Or the snow? Why is it always spring here?" The answer, of course, is that this is the forest where the last unicorn lives, keeping her "trees green" and her "friends protected." The hunters leave, knowing they'll never find prey here. 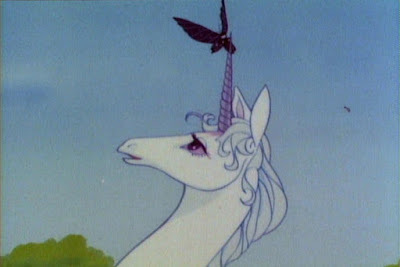 Next we meet the Last Unicorn herself and a very obnoxious, annoying butterfly, who's clearly been sampling the wild mushrooms. The unicorn, having heard a little of the hunters' conversation, tries to get some information from the butterfly (since he's been to other forests, etc.). Finally, after much singing and a few riddles, the butterfly insists, "You can find the others if you are brave." Unicorn sets out on her journey after that (it dawned on me at this point and a little later in the film that this movie totally qualifies for my chick flick series started last summer). We are treated to one of several songs performed by the group 'America.' "For in my heart I carry such a heavy load, here I am on man's road...It will be a long time 'til I find my abode." Foolishly, Unicorn falls asleep on the side of the road, where she's put under a spell and captured by Mommy Fortuna and displayed in a cage as part of the Midnight Carnival, where "beasts of the night are brought to light." The magician Schmendrick recognizes her for what she is and asks her what she sees in the cages around her. "Illusions, deceptions, mirages," she cries. "Your Mommy Fortuna cannot truly change things." Schmendrick agrees, and this is probably the best, somehow most relevant part for me: "That's true, she can only disguise. And only for those eager to believe whatever comes easiest." And yet, as I noted originally, there's something different about the visitors' experience when they come upon Unicorn's cage. Can they sense her authenticity or is it just the strong symbolism associated with a magical creature of her kind? I'm not sure, but children fall silent, innocent maidens cry, etc. Schmendrick helps Unicorn escape, and Unicorn in turn frees all the other beasts, including the only other authentic, magical creature, the Harpy, who immediately devours Mommy Fortuna. It's okay, though, because Mommy Fortuna was content simply to own Harpy, to have captured her. "You're mine. If you kill me, you're still mine." Having held an immortal creature captive provides her with some sort of immortality. Unicorn continues on her journey, with Schmendrick as her new travel companion. Shortly after escaping the Midnight Carnival, they come across a group of...nomads? I don't know, maybe that's just how people lived in the time of unicorns, in the forest, making rat soup for supper. Anyway, after magic tricks involving Robin Hood and an amorous tree, they're joined by scullery maid Molly Grue. I've never quite understood the scene where she initially gets mad at Unicorn for coming to her so late in life, as an old maid, rather than when she was a young maiden, as unicorns are supposed to. Even as a five-year old girl I remember being really perplexed by what that meant? Is it a coming-of-age thing? A symbol for innocence? At any rate, Molly quickly forgives Unicorn and they become fast friends and confidantes. They carry on closer to King Haggard's castle, Unicorn having pieced together most of the puzzle by now, until the Red Bull gets a whiff of her. He chases her around a bit, until Schmendrick changes her into "a hot anime chick," as Neal described her. As a human girl, the Red Bull has no interest in her and so leaves them. Unicorn, soon to be renamed Lady Amalthea, is confused by her new form, not a girl...er, unicorn, not yet a woman. Or something like that. She can already feel her mortality setting in. Later, in the castle, she sings a song about it: "I was innocent and wise and full of pain. Now that I'm a woman, everything is strange." I hear ya, sister. The whole castle bit is probably my least favorite part of the film for some reason. 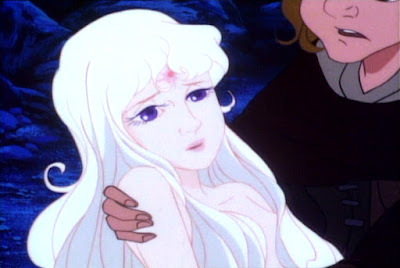 I'm completely uninterested in the romance brewing between Lady Amalthea, as she continues to lose more and more of her immortal, unicorn self, and Prince Lir. How can you possibly fall in love with a freakish, mute girl so quickly? I always did like the cat character, though. So wise...and a tad ironic. "Oh, purr, purr." 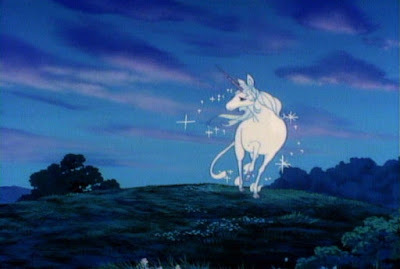 Anyway, just in the nick of time, before Lady Amalthea completely forgets her unicorn roots, the group discovers the Red Bull's lair and Schmendrick returns Unicorn to her original form. The Red Bull runs down a very valiant Prince Lir. Clearly fed up (that's what happens when you get turned into a woman), Unicorn drives the Red Bull into the ocean, making it possible, at last, for all the unicorns previously driven into the ocean by the bull, to escape and return to their forests. King Haggard falls to the ground as his castle collapses...I assume because of the stampede of unicorns, but it's not totally clear. Having been mortal, she's the only unicorn who knows love and regret. As she says goodbye to Molly and Schmendrick, she reflects, "I'm a little afraid to go home. I'm no longer like the others." 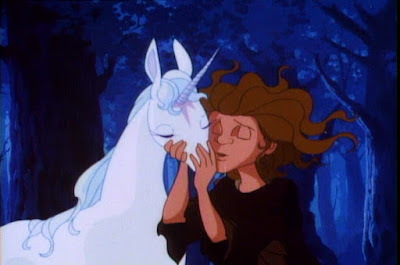 Even though the movie ends on a mostly happy note, with the forests re-populated with unicorns, I guess because I identify with the Last Unicorn's character, I always feel really sad for her. She's still singled out, first as the last, now just...different. In a weird and unexpected way, this movie touches on both bodies of work I've had going this past year or so, about both travel and the uneasy relationship between authentic objects and their copies, and about coming-of-age. Unicorn's journey is a success, in the end, but she's forever changed, not unlike myself after my recent travels. This movie was one I loved as a child. who does he think he is, Christo?